The following is a representative listing of some of Schluter’s trademarks that are protected by law in North America and abroad. 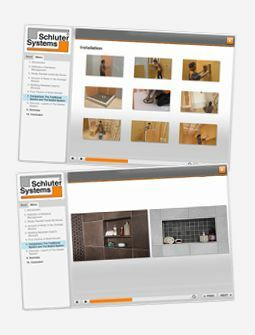 Please be aware that Schluter’s creative teams are continuously developing and launching new product and marketing ideas. These ideas are often in the development stage for many years prior to being launched. Schluter will, on occasion, consider creative ideas from outside sources. Any such consideration, however, will be done only after Schluter has entered into a written confidential disclosure agreement with such outside sources. Unless and until a confidential legal agreement is in place, Schluter cannot confidentially accept or consider outside submissions of any creative ideas or suggestions relating to products or concepts. Accordingly, unless you are already party to a written confidential disclosure agreement with Schluter, do not send to Schluter any creative or original materials such as ideas for products, or any other creative suggestions, ideas, concepts or other information. Absent such an agreement, if you choose to forward or transmit to Schluter’s website by electronic mail (or any other form of communication) any product ideas, suggestions, communications or materials, including any personal data, questions, answers, comments, suggestions, or the like, such material will be treated as non-confidential and non-proprietary. Absent a written agreement to the contrary, Schluter reserves its right to use any ideas or concepts contained in any communication you send to Schluter’s website or email for any purpose whatsoever, including but not limited to developing, manufacturing and marketing products using such information. Schluter may consider ideas that are covered by an issued patent. If you wish to forward any such information, please include specific information regarding your patent, including the patent number(s).